Three days ago, I ended a cell phone call that had lasted an hour and a half and stood in the atrium of the corporate office building where I work and stared out at the parking lot and the cold blue sky. The feeling in my body—a dry, raw throat, a thudding in my head, exhaustion spreading through my limbs—was as if I had just spent the duration of the long call inconsolably sobbing. In fact, I had been on the phone with AT&T, pleading and demanding and, ultimately, producing something like muted, measured howling, the sound a hybrid creature might make if that hybrid creature was partially a middle-aged cubicle occupant and partially a small jittery woodland mammal ensnared in the sharp teeth of a powerful metal trap. I don’t feel like going into the details of the situation that resulted in and was completely unresolved by the one and a half hour phone call, but—in a life pocked, like everyone else’s, with such random victimizations—it has been my most frustrating experience yet with an utterly indifferent, incompetent corporate behemoth, and it has fucked with my life for several weeks. After ending the long and useless cell phone call, I wanted to drop atom bombs or dig a hole in the ground and fall in or smash things with a baseball bat or climb back into the womb or drink a river of bourbon or sleep for the next ten or twelve years. Instead, I took a deep breath, walked back upstairs, apologized to my boss for missing a meeting, returned to my cube, woke my computer, and worked. The 2011 baseball season is about to begin amid this crystallization of my place in the world: more or less a speck, powerless. I look to this Juan Beniquez card for signs that the coming season will be a good one for the team I’ve looked to for three and a half decades to provide everything to me that has ever been otherwise lacking in my life. I’ve looked to the Red Sox to make me feel happy, to make me feel victorious, to make me feel powerful, to make me feel like the year, whichever year it is, is the year, a year that will not slip past like nothing, like I wasn’t even here in the first place. I look to Juan Beniquez and my 43-year-old eyes see a guy on the brink of a baseball life of transience, a major league equivalent of a powerless speck. I know now that he left the Red Sox soon after this 1975 card came out and traveled from team to team for years, never really settling anywhere. This can’t have been easy to hear, again and again: Juan, you’re gone, Juan, you’re gone. 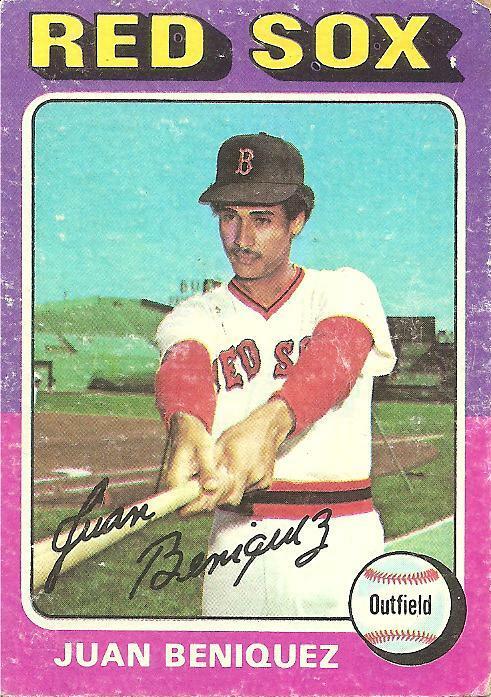 But I also look to Juan Beniquez and see a battered, well-handled 36-year-old baseball card, beloved. I see the small hands that reached for it and held it again and again. The year this card came out was my first full year of collecting cards, and following my big brother’s lead I sorted the cards into teams, my little collection of Red Sox by far my most valued rubber-band wrapped stack, and within that stack I sorted by that most fundamental of sorting systems, still relatively new to me, the alphabet, and so Juan Beniquez was on the top of my stack of Red Sox the year I fell in love for good with that team and with cards and with baseball. Below him was Burleson and Carbo and Cleveland and all the others, but he was on top, the first of the Red Sox. I have always thought of him this way, though I hadn’t realized it until now. It’s the reason why—even though he left the team the next season and played for many years and for many other teams after leaving—I still think of him as a definitive Red Sox player from my childhood. I still think of him not as a Texas Ranger or California Angel or Seattle Mariner but instead exactly as he is here, a young, whip-thin guy with a sly grin on his face, holding his bat straight out in front of him like he’s mocking a dowser or making fun of a teammate by pretending his bat is that proverbial barrier from disgustingness, the ten-foot pole. Or like he’s holding the bat out playfully for someone to try pulling it out of his hands, an offer to take him up in a tug of war. I see myself as the seven-year-old boy who didn’t have any notion that he’d grow up to be, like pretty much everyone else, more or less a powerless speck, and when I was a seven-year-old boy I imagined myself right into the card. This, along with Juan Beniquez’ defining status throughout 1975 as the first of the Red Sox, is why the card looks so beat up. I see that little kid handling the card again and again, his imagination carrying him into the world of the card. The little kid, with a bright-eyed grin, grabs hold of the outstretched bat and tries to pull it from Juan Beniquez’s hands. The little kid giggles as the tug-of-war ensues, Juan Beniquez keeping the sly deadpan smirk on his face. It’s not a real struggle but something else, something more important: a game. The 2011 season is about to start and I try not to hope for anything anymore because hope distorts and disconnects and ensnares but despite knowledge of such things I feel once again an echo of that old giggly feeling, like I’m part of the game, like I’m connected, like I’ve got my hands on something and I have the power to pull it toward me. There’s hope. You are currently browsing the archives for the Juan Beniquez category.